Nik Nanos digs beneath the numbers with CBC News Network's Power & Politics host Evan Solomon to get at the political, economic and social forces that shape our lives. This week: The economic and political costs of youth unemployment. Nik Nanos digs beneath the numbers with CBC Power & Politics host Evan Solomon to get to the political, economic and social forces that shape our lives. This week: The economic and political costs of youth unemployment. 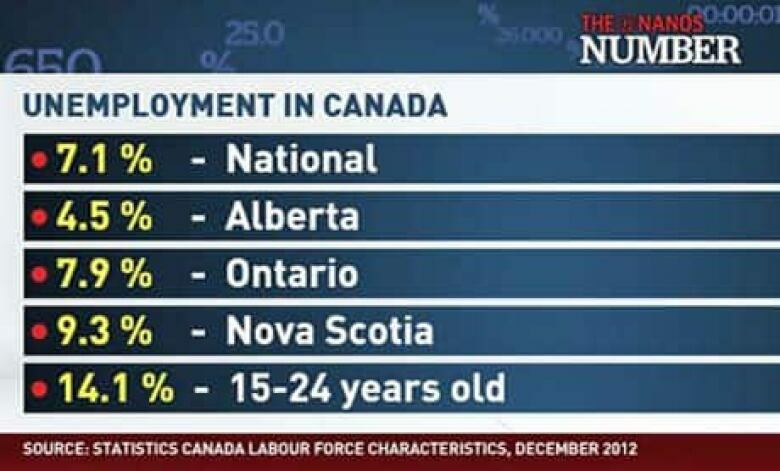 The youth unemployment rate in Canada in December. Youth unemployment was at the top of the Commons agenda on Wednesday in question period. The latest numbers from Statistics Canada show the youth unemployment rate is double the national average at 14.1 per cent. That includes people between the ages of 15 and 24 years. Youth dissatisfaction and unrest has driven a few movements in Canada over the past year, including the student protests in Quebec and more recently the Idle No More protests across the county. 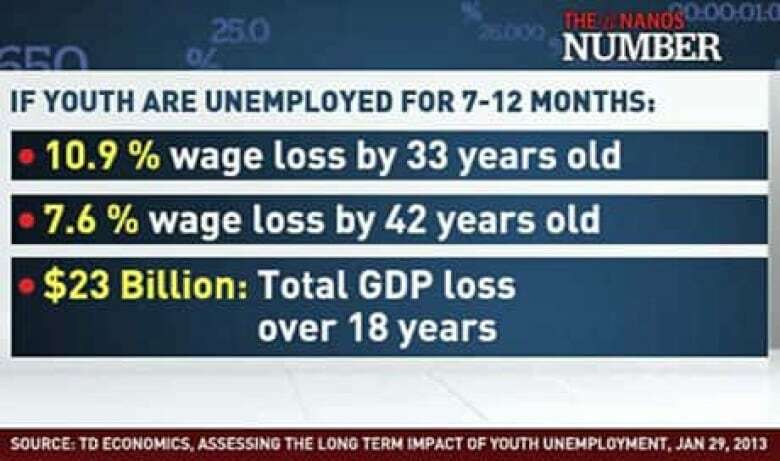 Now a new report called "Assessing the Long Term Impact of Youth Unemployment," released Tuesday by TD Economics, reveals that youth unemployment will cost the country billions of dollars over the next two decades. The report shows that over the span of 18 years, youth unemployment will cost the Canadian economy $23 billion. It also reveals that a short stint of unemployment, ranging between 7 to 12 months, when someone is young has a dramatic affect on their earnings later in life. The political impact of youth unemployment is also cause for concern. But, according to Nik Nanos, politicians have not done a good job in addressing this issue. "It has been thin public policy gruel," Nanos said. There has also been a lot of talk about connecting and engaging with young Canadians and encouraging them to vote, but nothing has really stuck at this point, Nanos said. The key might be in job creation, Nanos said, pointing to studies done by Elections Canada that suggests a direct link between having a job and voting. "Once young people become taxpayers, they start to get more engaged. So maybe instead of thinking about youth issues in order to appeal to youth, maybe we should be thinking about job creation," he said. The Conservatives target working families and middle-income Canadians and the NDP usually targets working class families, Nanos said. One leader that might have an in with young Canadians is Green Party Leader Elizabeth May. "We know from research that's been done around the world that the Green Party tends to attract younger people. The challenge is it will take more than an environment and a green message for Elizabeth May to attract younger voters. "She's got to fold in jobs and hope for young people and then overlay the environment on top of that," Nanos said. And that might be advice all political parties should take, Nanos adds. Instead of having a youth strategy focussed on the environment, innovation or education, focus it on jobs. "Helping young people get jobs and to start them on the path to have a fulfilling personal life and also career" could be a successful strategy.